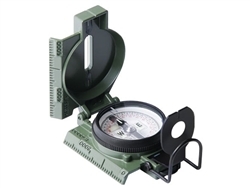 Cammenga manufactures the battle-tested Model 27 phosphorescent lensatic navigational and marching compass according to the U.S. Army Mil-Spec. This compass is identical to the Army model, except for phosphorescent markings instead of the self-luminous Tritium vials. Lensatic style features a magnifier lens on the rear sight to read compass dial headings for greater accuracy and a sighting wire for shooting azimuth. The metal case and induction damped needle provide reliable performance. Phosphorus-based luminous points glow for long periods after an external light charge. Designed for all uses, all climates and is less expensive than the Tritium self-luminous genuine military model. Made in USA by CAMMENGA.